Cynthia Howard our current chair recently toured with Jon Madin to Nepal in January 2018. As many of you may be aware, Cynthia has been visiting Nepal over the past two years and from these tours Cynthia has made films, taken lots of photos, written articles of her visits which gained the attention of music educator Jon Madin. 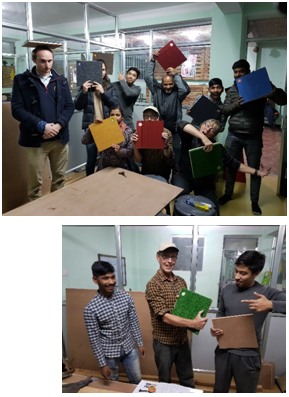 Jon was most impressed by this work and because of his previous experience in working in other countries such as Timor, Jon expressed an interest in the possibility of building instruments in Nepal. This would be a great inclusion to the MusicArt Society program. MusicArt Society already had some xylophones and two glockenspiels from Cynthia’s first trip to Nepal. Marimbas would only enhance the existing musical family. 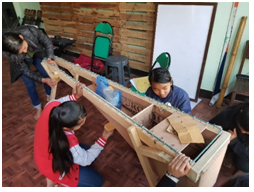 This was a fantastic idea because not only would the school gain two marimbas, but the community would learn how to build such instruments to expand or to sell as a form of income for the school. Jon also wanted to make a set of ding boxes. Ding boxes are a set of boxes that you jump on. They are in the scale of C major and you can add them where ever you like in your music. They great fun and were overwhelmingly accepted by all at MusicArt Society. Cynthia set up a GoFundMe page and managed to raise over $1,700 through close friends, work colleagues and from Illawarra Primary School who hosted an event which raised $250. There was enough to pay for our materials, Taxi’s and tools. There is still some money remaining which will be kept aside for further instrument making and or to support Sumit Pokhrel to attend the ISME International Conference in Baku later this year. Cynthia said the participation from the students was overwhelming. They would turn up daily ready for the next step of making the instruments, chizzling out wood to make the notes for the marimba, sanding, sawing, measuring, glueing, even finding where to get a good coffee for Jon. Once the instruments could be used, students would jam in the afternoon to many of Jon’s tunes which also included dancing and singing. 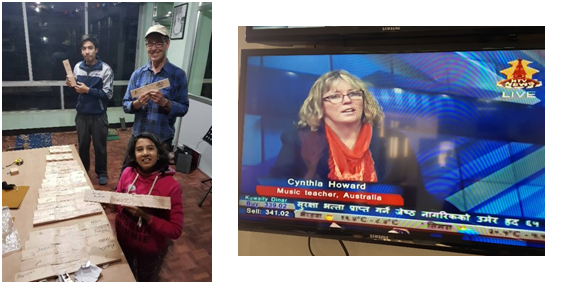 Cynthia also caught the eye of the National TV company, Nepali TV and was interviewed live for 20 minutes with snippets of film with Jon and the children working on their instruments. This was a highly successful trip and Jon thinking of returning to Nepal to make more instruments in the future. Cynthia would like to personally thank the students and teachers of Nepal for being so enthusiastic by engaging in this program so eagerly, and to Jon Madin for offering his time for free and paying his own way to help others, to all the GoFundMe financial donors, Mark Barrent for his donation of five Ukuleles and to TASME for the organisation’s continued support of MusicArt Society. The MusicArt Society Nepal and the Australian Society for Music Education (Tasmania) hereby agree to advance a mutually supportive relationship. This relationship is underpinned by the belief that everybody has a right to an education that includes access to quality Music education. Each organisation seeks to support the work of the other in ways that influence student learning in Music. Each organisation seeks to support the work of the other in improving teacher professional learning in Music education. 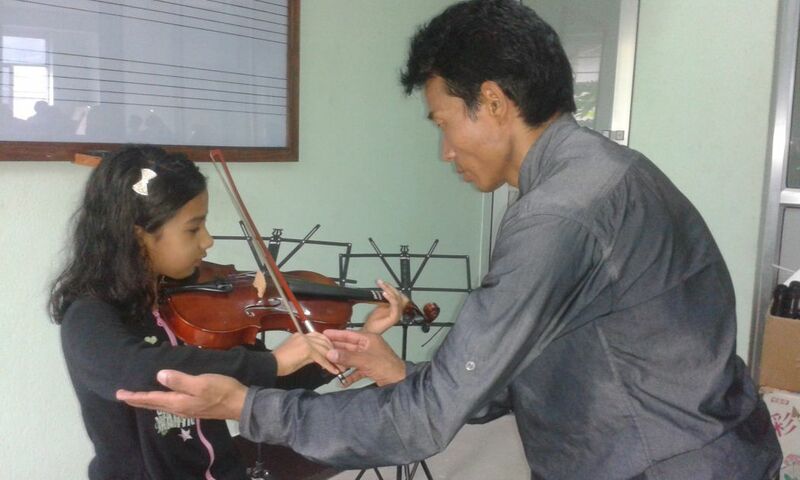 Through the MusicArt Society Nepal the Australian Society for Music Education (Tasmania) seeks to support Music education for students at the Humanitarian Concern Centre orphanage located in Budhanilakantha, Kathmandu. 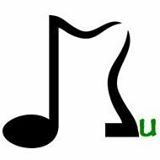 Through the MusicArt Society Nepal the Australian Society for Music Education (Tasmania) seeks to support Music education for underprivileged students, students with special needs (including financial) and other students associated with MusicArt Society Nepal.